← Message from a Soldier: Pvt. Arthur Elsasser Jr.
It’s finally here, my post about Cy De Vry that’s been in the queue for months. There is a very common card published by V.O. 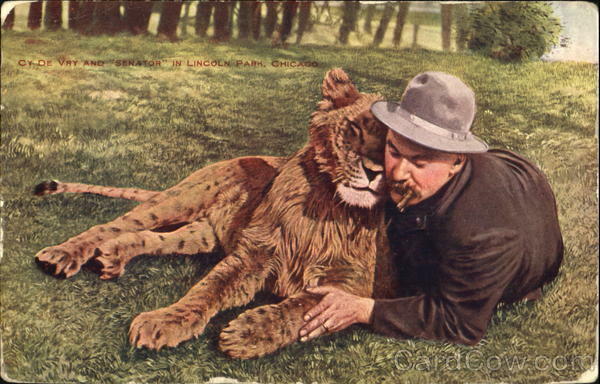 Hammon (pulling the image from CardCow below since I don’t own it for some reason) that shows Cy De Vry and Senator the lion in Lincoln Park, Chicago. Bob Fitzsimmons was a British boxer, the first person to be a triple world champion. He even knocked out Jack Dempsey. He had a pet lion named Senator, perhaps this Senator, because what are the chances that there are two Bob Fitzsimmons’ out there with two lions named Senator. In 1912, under Cy’s supervision, a $160,000 animal palace began construction, built out of brick per his suggestion. “Mr. Lion and Mrs. Lion will will roar their approval of the new home. Mr. Tiger will do the same- only he will not roar- and the other ‘pets’ I know so well surely will find a way to show their appreciation,” he’s quoted as saying. In 1915, Cy almost left Chicago when he was offered a salary of $7,800 per year from Col. William N. Selig, “the man who invented Hollywood.” Petitions came in for him to stay, and he decided to stay at Lincoln Park Zoo for $5,000 a year. More powerful than the petitions, though, was a boy who asked Cy if he was Cy De Vry, because if so, he wanted to shake hands with him. This entry was posted in Chicago and tagged Chicago, Cy De Vry, Lincoln Park, Lincoln Park Zoo, Lion, Senator. Bookmark the permalink.